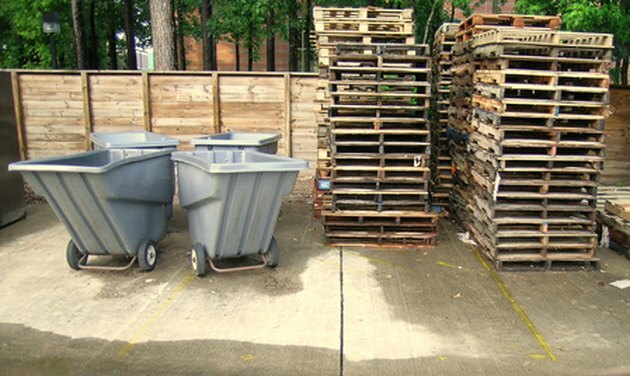 A pallet, a portable wooden platform used to store or support goods, is flat and can be conveniently stacked or lifted by a forklift. Because pallets are constantly exposed to heavy and abrasive content, they lose density over time. The wood eventually dries out, leading to a brittle foundation. To prevent the pallet from cracking beneath a load, the wood requires a protective varnish to reseal the surface. Isolate the pallet in an open, well-ventilated workspace. Wear a dust mask and protective eyewear before sanding or working with chemicals. Stir a can of sanding sealer with a stirring stick until all of the contents have been mixed thoroughly. Use a natural-bristle brush to apply an even coat to the pallet, following the direction of the wood grain. Wipe away excess product with a clean rag before it dries. The sealer will be completely dry within minutes. Smooth the pallet with a 280-grit sanding sponge in preparation for a wood varnish. Sand the surface until it appears uniformly dull. Seal and protect the wooden pallet using a polyurethane wood varnish. Apply the product with a painter's rag or foam applicator brush in the direction of the wood grain. Allow it to cure overnight. Repeat steps 4 and 5 at least once more as additional coats of varnish effectively seal moisture in the wood. This will prevent the pallet from cracking, drying and warping. Do not sand the finish coat.